It is said that in ancient times there was a magic rock on the Mountain of Flowers and Fruit of Aolai County in Tungsheng State. The rock had been favored the elements of nature for millions of years.Then, one day, suddenly, it burst open, giving birth to a stone egg from which a stone monkey emerged. Quasar J0842+1835 helped scientists measure the speed of gravity when Jupiter passed 3.7 arc minutes from it on September 8, 2002. Isaac Newton imagined that the effect of the force of gravity was instantaneous. In other words, if we could imagine for the sake of argument a scenario in which the Sun suddenly vanished, then planets would also suddenly stop moving in their elliptical orbits and shoot off into space in straight lines. Einstein, however, thought that gravity travels at the speed of light and so in that case, to reuse our hypothetical example, after the Sun had disappeared, Mercury would continue to orbit the empty space where the Sun used to be for a full 3.2 minutes before shooting off in a straight line. Then 2.8 minutes later, Venus would stop orbiting, then Earth after another 2.3 minutes, then Mars after another 4.7 minutes and so on. Finally, the news of the disappearance of the Sun wouldn't reach Pluto for five and half hours! This kind of propagation of gravity through space is called a gravity wave and these are an important prediction of Einstein's 1915 General Theory of Relativity. While Einstein's theory has been continually to be shown correct by the countless experiments that have been performed over the past ninety or so years, existence of gravity waves or that there is a limit to the speed of gravity, has remained unproven. Gravity waves are assumed to be emitted by massive objects that are suddenly accelerated or rapidly change in density and such things are not considered rare in a Universe jam-packed with pulsars, binary stars and super novae. Nevertheless, direct methods of gravity wave detection are extraordinarily difficult and have so far been unsuccessful. While it has been assumed that the requisite step in measuring the speed of gravity is to first detect gravity waves, recently a far simpler method was proposed by Sergei Kopeiken of the University of Missouri. Kopeikin has been working in collaboration with Ed Fomalont of the National Radio Astronomy Observatory and the result that they announced this month is that, yes, gravity does indeed move at the speed of light. Or does it really? Not everyone agrees with this and some scientists think that the reason why gravity appears to move at the speed of light is because Kopeikin and Fomalont didn't measure the speed of gravity at all but instead ended up measuring the speed of light itself (but in the most arse-about convoluted way possible!). LapLog1 readers are cordially invited to make up their own minds. The Speed of Gravity Can the speed of gravity be measured directly through the observation of gravitational lensing effects? Two scientists who monitored the deflection of quasar light as it passed very near Jupiter argue that they have derived an experimental value for the speed of gravity equal to 1.06 times the speed of light (with an uncertainty of 20%). But two other scientists claim that the lensing experiment only served as a crude measurement of the speed of light itself. Physicists have long taken for granted that the effect of gravitational force, like the effect of electromagnetic force, is not instantaneous but should travel at a finite velocity. A familiar example of this delay is the fact that when we see the sun, we see it as it was 8 minutes ago. Many believe that gravity also travels at the speed of light. The trouble is, while it is relatively easy to gauge the strength of gravity (one can measure gravity even near a black hole, where orbiting matter emits telltale x rays), it is difficult to study the propagation of gravity. Although not as heavy as a star, Jupiter still has considerable gravity, and when on September 8, 2002, it swept very near the position of quasar J0842 + 1835, the theory of general relativity suggests that the apparent quasar position on the sky would execute a small loop over the course of several days owing to the lensing of quasar light by the passing planet. Sergei Kopeiken (University of Missouri) and Ed Fomolont (National Radio Astronomy Observatory, or NRAO) have now seen just such a loop, as they reported this week at the meeting of the American Astronomical Society (AAS) in Seattle. For this purpose they employed the Very Long Baseline Array (VLBA) of radio telescopes, a configuration of dish detectors providing an angular resolution of 10 micro-arcseconds. Actually the observed lensing loop was slightly displaced from what one would expect if gravity propagated instantaneously. Kopeiken and Fomolont interpret this slight displacement as providing an experimental handle on the speed of gravity itself, and thereby calculate the value of 1.06 times c. Other scientists disagree with this interpretation, and say that the radio lensing data can do little more than provide a measurement of the speed of light, not gravity. Two such opinions, by scientists who did not report at the AAS meeting, are as follows: Clifford Will of Washington University in the US and Hideki Asada of Hirosaki University in Japan . Propagation Speed of Gravity and the Relativistic Time Delay Clifford M. Will We calculate the delay in the propagation of a light signal past a massive body that moves with speed v, under the assumption that the speed of propagation of the gravitational interaction c_g differs from that of light. Using the post-Newtonian approximation, we consider an expansion in powers of v/c beyond the leading ``Shapiro'' time delay effect, while working to first order only in Gm/c^2, and show that the altered propagation speed of the gravitational signal has no effect whatsoever on the time delay to first order in v/c beyond the leading term, although it will have an effect to second and higher order. We show that the only other possible effects of an altered speed c_g at this order arise from a modification of the parametrized post-Newtonian (PPN) coefficient \alpha_1 of the metric from the value zero predicted by general relativity. Current solar-system measurements already provide tight bounds on such a modification. We conclude that recent measurements of the propagation of radio signals past Jupiter are sensitive to \alpha_1, but are not directly sensitive to the speed of propagation of gravity. The Light-cone Effect on the Shapiro Time Delay Author: Hideki Asada We investigate the light-cone effect on the Shapiro time delay. The extra time delay caused by Jupiter on the 8th of September 2002 can be measured by advanced VLBI (very long baseline interferometry). Our expression for the delay is in complete agreement with that of Kopeikin (2001), in which he argued that the excess time delay was due to the propagation of gravity. The present letter, however, shows that the excess comes from nothing but the propagation of light, namely the light-cone effect. To make a robust confirmation of general relativity by the coming Jupiter event, it is important to take account of the light-cone effect on the Shapiro time delay. That site in the North Cachar Hills of north-eastern India is mentioned briefly here. The Plain of Jars: Megalithic Culture in Northern Laos (abstract) Thongsa Sayavongkhamdy Department of Archaeology and Anthropology, The Faculties, Australian National University The megalithic culture related to the Plain of Jars is surrounded by mystery, since the function and history of the jars remains unravelled. There are approximately 40 stone jar sites scattered throughout the province of Xieng Khuang, Northern Laos; the biggest one contains 250 stone jars. 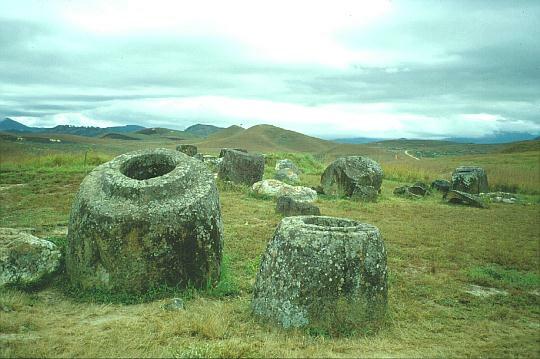 The stone jars are made of quarried sandstone that has been shaped and hollowed out; they are more or less cylindrical in shape and measure from 1 to 3.5 m in height with a diameter of 0.5 to 2.5 m. They weigh from between several to more than 20 tons; how they were transported from the quarry site to the "necropolis" site remains unexplained. According to local legends, these stone jars were used to ferment rice wine so the great army of Khun Cheuang could drink while celebrating the great victory won over a redoubtable enemy. Other legends suggest that the jars were used to store rice, foods or water. Archaeological research has shown that they were related to mortuary practices, but whether they were used as sarcophagi or funerary monuments remains unclear. Secondary burials and pottery jar burials have been found in the ground around the much larger stone jars. Grave goods were composed of: bronze ornaments, iron tools, and a variety of beads made from carnelian, glass and semi-precious stones. If one considers that these grave goods items represented "tradeable" objects, they could thus provide us with an insight into economic aspects of the past society. None-the-less, the wealth or/and the power possessed by the stone jar users remains far to be fully understood. The costs involved in the manufacture of the stone jars, and also probably in the performance of ritual ceremonies associated with the jars can hardly be estimated, since ownership of the jars remains an open question. Faced also with the paradigms of megalithic monuments, particularly with regards to their functions, one is stunned with the incredible amounts of energy, time and resources that were involved not only in their construction, but also in the realisation of related rites. Some authors, such as Heine-Geldern, have suggested that the megalithic monument served as a symbolic object regulating the survival of the whole group, as it was meant to be built and maintained as a collective operation and in many cases it refers to "the cult of fecundity" or similar beliefs which command the "reproduction" of the community. When and how the cult of the stone jar ceased in Northern Laos is another mystery although we can attribute this culture to the Metal Age on the ground that objects made of bronze and iron had been uncovered. What is the legacy the constructors of the stone jars have left us?